Saturday Sleuthing this week is focusing on a car that many V8 Supercar fans will remember well - the 1997 Primus 1000 Classic-winning Castrol Commodore VS driven to victory by Larry Perkins and Russell Ingall. 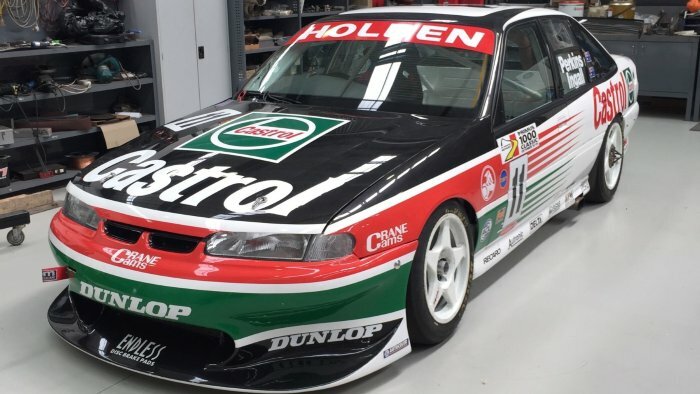 The duo's Bathurst-winning Commodore has recently undergone plenty of work and is in fact back on the track this weekend at Phillip Island as part of the growing Australian 5-Litre Touring Car Association's demo laps at the Phillip Island Classic historic event. Now owned by David Gardner, this important Bathurst-winning car - which took Perkins and Ingall to their second win at Mount Panorama in three years - has even had Larry's son Jack on the tools getting it ready for the road. But what about the car's history? 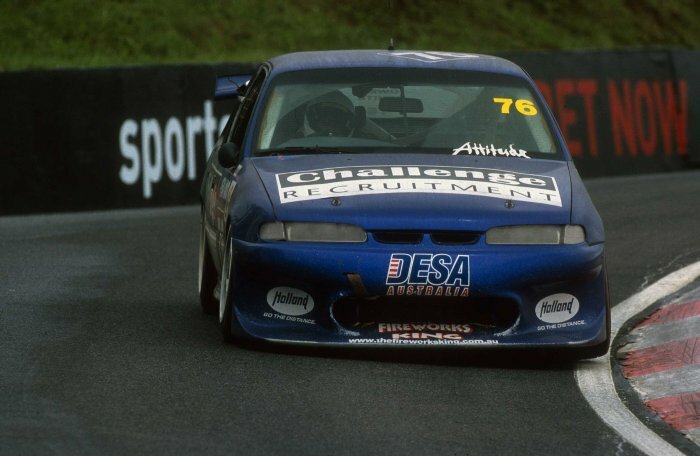 Which one was it and what else did it achieve during its V8 Supercar racing career? 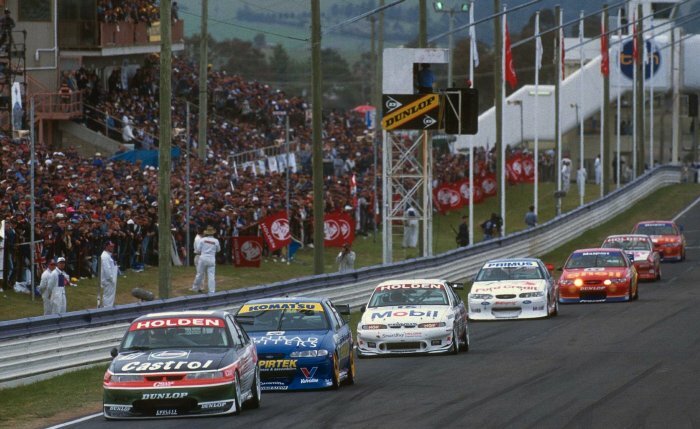 The Commodore - chassis PE 030RB ('RB' the designation for 'rebuild') - actually sits among a rare group of race cars in history in that it claimed victory at Bathurst on its racing debut! It was actually constructed to replace Larry's previous car - the original chassis 030 - which he crashed heavily at the top of the Mountain on the Bathurst Media Day just a few months before the race. Perkins qualified fourth and the duo ended up leading 80 of the 161 laps on their way to victory in a race well-remembered as being Peter Brock's farewell to full-time racing with the Holden Racing Team. "I remember we were setting quite a pace and I set a new lap record as early as lap five," recalls Perkins. "We started from the second row of the grid and I almost got around Brock on the outside going into the first corner. "I decided just to follow him and harass him a bit and then set the lap record. From there I thought 'this is going to be an easy race'. We just didn't have to do anything stupid, press on at a good pace and that's exactly what happened." 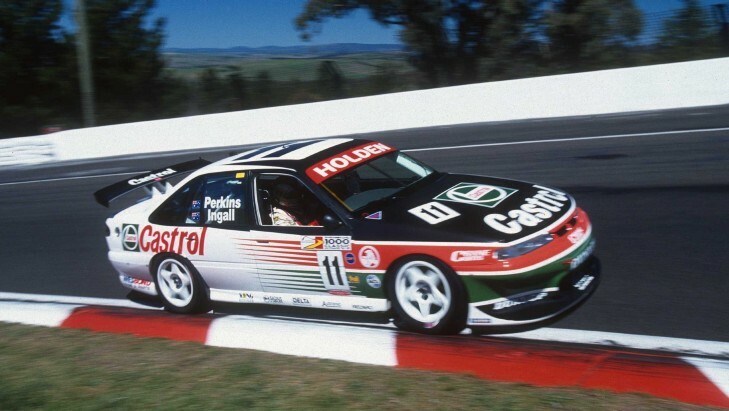 After its Bathurst victory the #11 Castrol Commodore stayed with the Perkins team for the 1998 Australian Touring Car Championship and was continued to be driven by the six-time Bathurst winner in the sprint races. 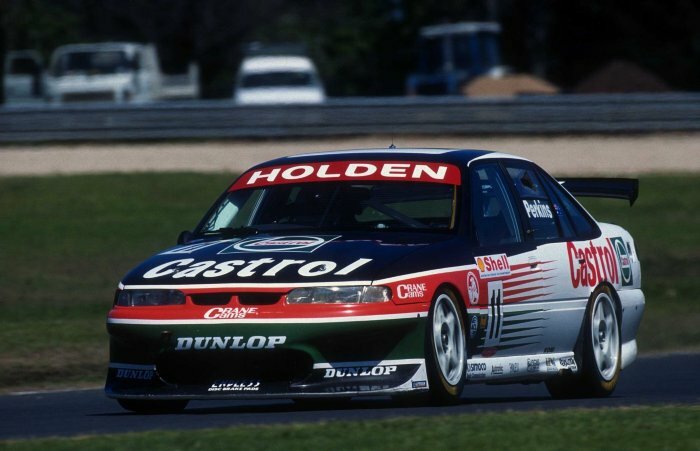 The new model VT Commodore arrived in time for Round 8 at Calder in Melbourne and Perkins gave the new car its debut, putting the '97 Bathurst winning car to the sidelines for the remainder of the season as the team developed its new car for the endurance races and beyond. The VS was sold to Sports Sedan racer Barry Morcom from Sydney in late 1998 before appearing in a plain white #52 livery in his hands at the opening round in 1999 at Eastern Creek and the Sensational Adelaide 500. He failed to quality for a handful of other rounds before the car found a new owner in ex-NASCAR and AUSCAR racer Matthew White, who purchased it with a view to competing in the new V8 Lites Series (now known as V8 Supercars Dunlop Series) in 2000. The former Super Speedway racer quickly adapted to V8 racing in the new feeder category and finished runner-up in the five-year series in its inaugural year to Dean Canto. As part of the reward for performing so well in the V8 Lites Series, White's car was eligible to join the field for the endurance races at Queensland Raceway (where he teamed with Terry Wyhoon to finish a brilliant 11th) and Bathurst (where Steve Owen co-drove and the car was repainted blue in the colours of sponsor Challenge Recruitment). It remained blue in 2001 as White then started the new season attempting to pre-qualify for a spot on the grid at a handful of V8 Supercars Championship rounds, which he managed to achieve - and also made a start at the Clipsal 500. The car returned to Bathurst later than year to compete in the very first DVS race (non-championship) at Mount Panorama with White (who was co-driving with David Besnard for Stone Brothers in the main race) finishing second to SBR-teammate-for-the-weekend Wayne Wakefield. White advertised the car for sale in 2002 but it did not attract a buyer and instead he ran it as a customer car in the DVS for former Porsche Cup driver Michael Turner before Todd Wanless drove it at Bathurst in the DVS support race. Purchased by Mark Seamons of Melbourne at the end of that year, the former Castrol Commodore underwent a restoration at Marty Brant's Independent Race Cars business, which was finished in 2004. A lot of the parts were reproduced in period fashion using the same techniques and original drawings from Perkins Engineering. The car made an appearance in Seamons' hands at the Clipsal 500 in 2005 before he sold it along with the Perkins/Ingall 1995 Bathurst winner as a pair to Lawrence Kalnin in late 2006. It would be placed on display for some time at the National Motor Racing Museum at Bathurst before it re-emerged as part of the Bathurst Grid Spectacular at the Muscle Car Masters on Father's Day in September 2013. By this stage it was owned by Michael Turner, who then sold it in late 2013 to current owner David Gardner. 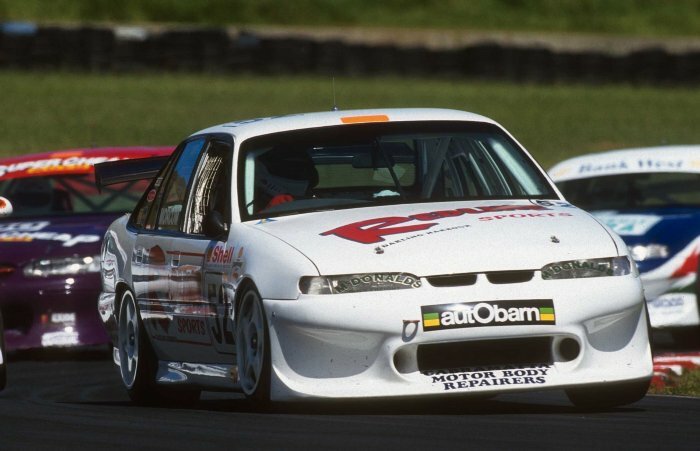 Gardner will be behind the wheel of it this weekend at Phillip Island, giving plenty of fans a great drive down memory lane with this iconic Castrol Perkins/Ingall Commodore. Saturday Sleuthing will take a break next weekend as the V8 Supercars compete in their non-championship event at Albert Park, but we'll be back on March 21 with another story on another great car from history. Championship win SVG's "goal in life"
Lowndes: Red Bull future "up in the air"